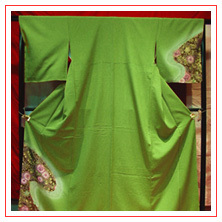 Every year celebrities, business executives and people who just want some privacy and peace of mind visit Kyoto. We offer unique, exclusive services for those who want a very special experience during their visit to the ancient capital. Find out more here. We offer a variety of custom tour packages to suit your own interests in exploring the ancient capital such as gourmet tours, shopping tours and more. 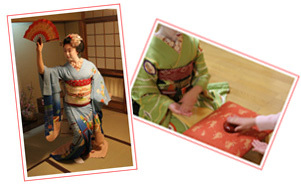 Have lessons in one of many of the Japanese traditional arts. By appointment only. Contact us for more information. 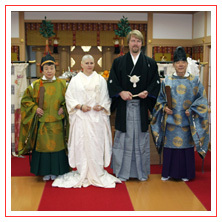 Have a traditional wedding ceremony in Kyoto. Unique, exotic, cultural, romantic...in the ancient capital. Having no off-season, Kyoto, the capital and center for culture and the arts from the years 794-1868, is world renown for the beauty and romantic atmosphere of the four seasons. With the cuisine, dining ware, alcove scrolls, and kimono/obi changing monthly, there is no better place to experience the true Japanese kokoro (heart/mind/ spirit). •Marriage ceremony in a Shinto shrine or Buddhist temple. 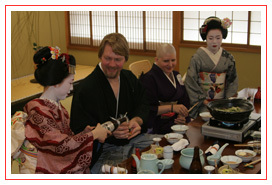 •Delicious Kyoto cuisine and drink (sake, beer, wine, spirits and soft drinks). Please let us know if you have any special dietary needs i.e. : vegetarian, allergies or religious and we will do our best to accommodate you. We will work with you to create a totally unique and unforgettable experience for you on this very special day. Note: This service is just a wedding ceremony or cultural experience so all marriages must be registered in your own country to make things official/legal.